Tea, scones, and cucumber sandwiches makes a wonderful afternoon treat. Peel a medium sized cucumber and slice very thin. Soak slices for one hour in salt water to make them crisp, then drain and pat dry with paper towels. Combine mayonnaise (or ranch dressing) and cream cheese in equal proportions until smooth. Cut rounds from white bread with a cookie cutter. Spread each slice with mayonnaise-cream cheese mixture. 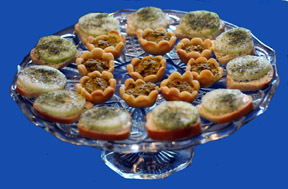 Top with a thin cucumber slice and sprinkle generously with dried dill weed. Cucumber slices are also excellent on deli cocktail rye bread. When I'm feeling particularly ambitious, I bake my own bread in miniature pans, so each sandwich is a full slice of bread, two inches or less square. Don't be afraid to try exotic varieties and unusual combinations. Imagination is the key.